Let them know that they are truly special! This abundant basket is perfect to send to friends, family or any springtime gathering. These decadent treats are daily hand-dipped and decorated for the ultimate fresh snack indulgence. 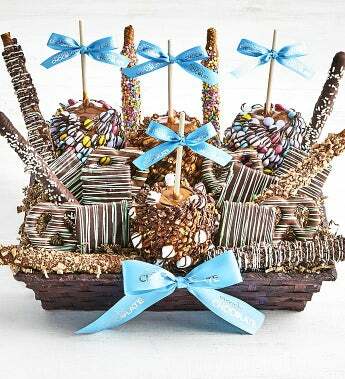 They'll love these delicious caramel pretzel rods, caramel apples, classic pretzel twists and chocolate covered grahams. All are individually cello wrapped and then the basket is placed in a cello gift bag with a beautiful turquoise bow.